Fatima Al Mansoori, Bahraini yoga therapist and humanitarian, was recently honoured for participating in ‘Puzhayamma’, the first film ever shot using a river as the backdrop from beginning to end to raise awareness about the rising threat of pollution and climate change. ‘Puzhayamma’ made in the language of Malayalam is produced by Gokulam Gopalan and directed by Vijeesh Mani. “I made a brief guest appearance in the environmental movie which focuses on efforts to raise awareness about the rising pollution threats, resource depletion and climate change,” Fatima says. “I don’t know whether I am the first Bahraini to appear in an Indian movie…I prefer to think of it as a guest appearance in a movie rather than acting in it,” she says. 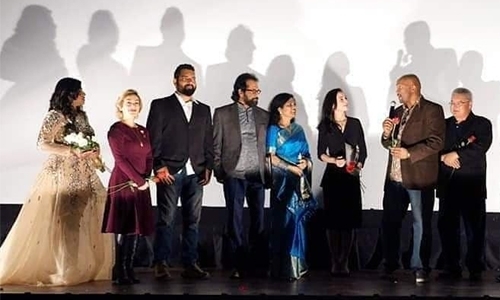 “I agreed as God’s Own Country ,Kerala, has always a place close to my heart.” Fatima was honoured at the world premiere of Puzhayamma at the Towne 3 Cinemas Indian Movie Hub in San Jose, California. Puzhayamma won the Asia Book of Records for the film with river as single backdrop theme in every scene. “During August, when I made my customary visit to Mangalore University to take lectures at the department of Yoga, one of my Malayali friends invited me to his home in Kannur. “At that time I was invited by the director Vijeesh Mani. I was to be part of that movie which raises awareness about climate changes which are caused by humans. “At first I wasn’t interested, as I am just a social worker, not an actor,” she says. Her decision changed when Vijeesh explained to her the theme of the movie.The disastrous calamity 2018 Kerala floods, also plays a major role in this film. The film is completely shot in a river, a first in world films statistics. Puzhayamma, based on river pollution, is an environmental film, made on cleanliness, one of the goals of the pilgrimage message to be promoted as per the teachings of Indian spiritual leader Sree Narayana Guru. “They said that it was an environmental documentary with a direct connection to the flood and will help raise awareness about the dangers of river pollution,” Fatima says. “I thought it would be an environment documentary about the floods but was surprised when I got to know that it’s a movie with a big crew,” she adds. It was an honour to have received an “Asia Book of Records certificate” for participating in the first film ever shot with the river as the backdrop from beginning to end. The movie shows its credit to Bahrain. “I am thankful for the special mention of Bahrain on the credits screen. “I have devoted my life for humanitarian activities and have been travelling across countries to offer support wherever needed. “I believe I was destined to be in Kerala at that time so that I could help others. Although I was told to stay away from the affected areas and take the next flight available back to where I came from, I decided to stay back and visit the camps.” Fatima says that her guest appearance in this environmental movie is part of her social work and humanitarian efforts to raise awareness about the sustainable development goals.